In our past few blogs, we’ve explored the fascinating life and death of Cleopatra. Never one to shy away from drama or scandal, her life seems to be the material of soap operas. As far as we know, no soap operas were made documenting Cleopatra’s unique life, but several movies were made about her, including the famous 1963 film starring Elizabeth Taylor. Today, we would like to focus on one her famous lovers, Mark Antony, and their romantic and political union. Born in Rome in 83 BCE, Mark Antony was the son of a military commander and the grandson of a famous public speaker, both with the same name. As a young man, Antony worked as a cavalry officer, winning battles in Palestine and Egypt. Even early on in his life, Antony was known for being athletic and loyal to his friends and also for his drinking and carousing. Apparently, Antony was considered to be a very attractive, fun-loving man, a trait that the ladies simply couldn’t resist. Mark Antony’s life would forever change when he traveled to Gaul to serve as a staff officer in Gaul with Julius Caesar. Caesar conquered Gaul for Rome with Antony advising him and assisting him in suppressing local rebellions. As Caesar gained more power, Antony served as his second-in-command. Although Caesar rose to power as a dictator, his authoritarian rule remained wildly unpopular with many Romans. In turn, his trusted advisor Mark Antony was even expelled from the Senate by his anti-Caesar colleagues. However, Caesar remained in power with Antony as his co-consul until his assassination in 44 BCE. Much to the surprise of Antony, Caesar left his wealth and title to his 17 year old adopted son, Octavian. However, Antony questioned the teenager’s ability to rule an empire and the two quickly became rivals. After battling for power, the two decided to become allies along with Lepidus. They agreed that Lepidus would rule Africa, Octavian would rule the West, and Antony would rule the East. After summoning Cleopatra to question her loyalty, he fell madly in love with the smart, beautiful, and charming woman. Cleopatra had been a lover of Caesar’s for the last few years of his life, and she quickly began an affair with Antony in 41 BCE. They even had three children together, twins Alexander Helios and Cleopatra Selene and son Ptolemy Philadelphus. Mark Antony’s relationship with Cleopatra would end up destroying both of their lives. After stripping Lepidus of his power, Octavian declared war on Cleopatra in an effort to gain total control of the Roman Empire. After his forces defeated Cleopatra and Antony’s army, Mark Antony committed suicide. Some say that he mistakenly believed that Cleopatra was already dead, which is why he took his own life by stabbing himself. As he was bleeding to death, he was brought to die in Cleopatra’s arms. She then reportedly took her own life by tying a highly venomous snake to her arm as the snake struck her. This relationship ended with as much passion and melodrama as it began with. 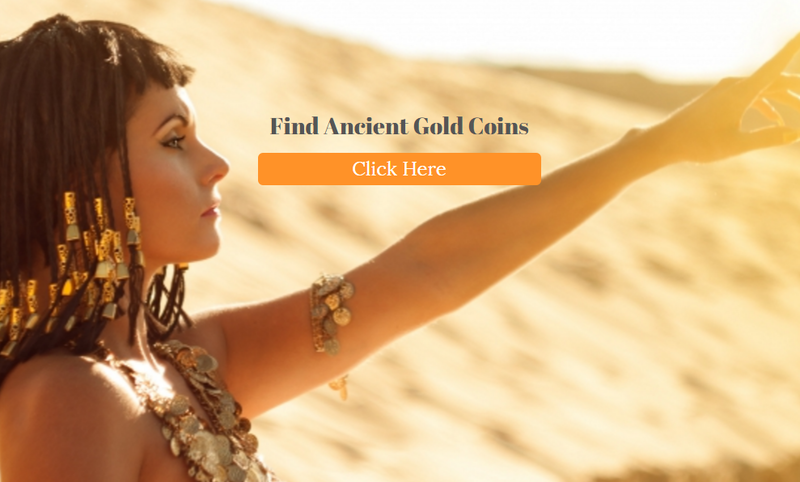 At Ancient Gold Coins, we feature a variety of ancient Egyptian spanning the Ptolemaic Dynasty that Cleopatra was a part of. 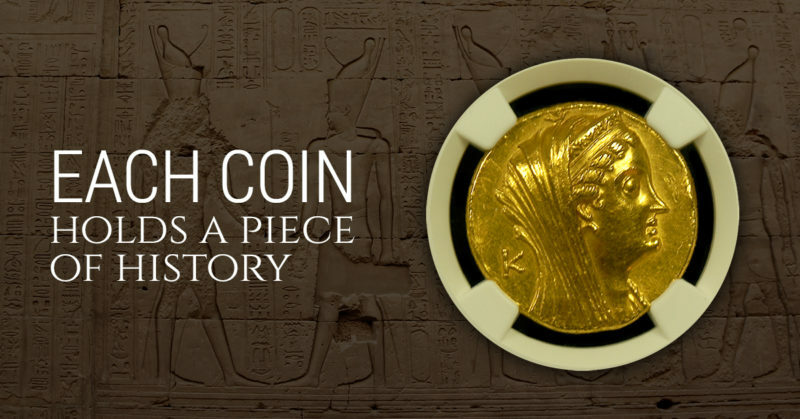 We feature a variety of old Egyptian coins with a truly fascinating history as well as ancient Greek coins, ancient Persian coins, and ancient Roman coins. When you purchase our collectible gold coins, you possess a historical artifact from some of the most interesting eras in history.